Preheat oven to 350°F. Line an 8x8 pan with aluminum foil and spray with cooking spray. In a bowl add flour, baking powder, baking soda, salt, and walnuts. Whisk to combine. Set aside. In a large bowl, mix the melted butter and brown sugar with a mixer. Add the egg and vanilla and mix well. Add the flour mixture a little at a time until combined. Stir in white chocolate chips. Spread into the 8x8 pan and bake for 20-25 minutes or until center passes the toothpick test. I like mine a little on the gooey side. Remember right out of the oven they may seem gooey but once they cool they set up more. For the Maple Butter Sauce: In a small bowl add the butter, powdered sugar, cream cheese, and maple syrup. Blend with a mixer until smooth. When ready to serve, heat the maple butter sauce for about 30 seconds in the microwave and pour over warmed blondie and ice cream. The season of chocolate is upon us, but not everyone is a chocolate lover. (*gasp! *) Here's the perfect dessert for "the other half." Chocolate is such an integral part of my life that I wasn’t sure if I could make room for any other desserts. But there is one non-chocolate dessert that I’ve had probably over 100 times in my life at a well known restaurant. This Maple Walnut Blondie is my version of my favorite dessert there. I think I’ve blondied my family out with all of the copycat recipes I’ve tried, but they never quite cut it compared to the original. 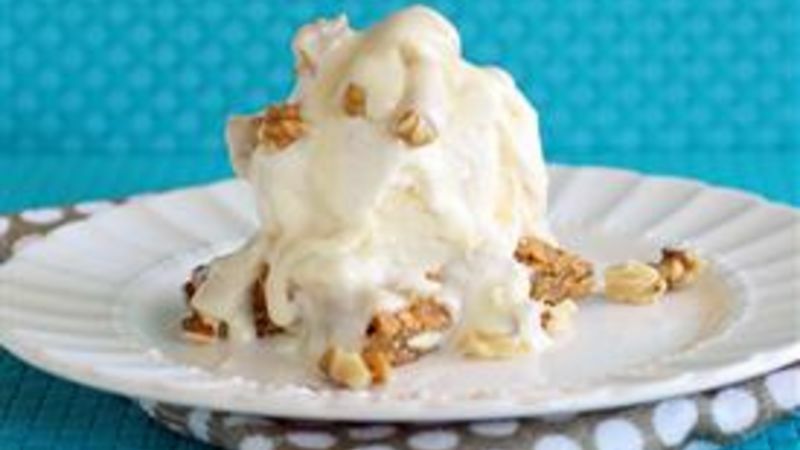 This is a warm, chewy blondie studded with white chocolate chips and walnuts, topped with a scoop of ice cream, and drizzled with warm maple butter sauce. I usually let the food do the talking, but I can’t help but say that these are incredible! The batter is super thick, but that results in a chewy buttery blondie. My husband was in charge of scooping the ice cream so the ice cream to blondie ratio is a little heavy on the ice cream side but you’ll make do, won’t ya. What really makes these blondies is the maple butter sauce. This is the part that I’ve never been able to perfect quite like my restaurant favorite. But I found with the addition of a little cream cheese, the sauce is creamy, smooth, and spot on! Your non-chocolate and chocolate lovers are going to have a new love…these Maple Walnut Blondies. Love maple flavor? Try more recipes that feature it! Are you a maple fan?